Nearly a decade of advanced research, design and engineering have delivered to the market the most sophisticated solar charge controller in the world. This microprocessor controlled charge controller is completely programmable and automatically adjusts to panels rated 12 Volts through 48 Volts. 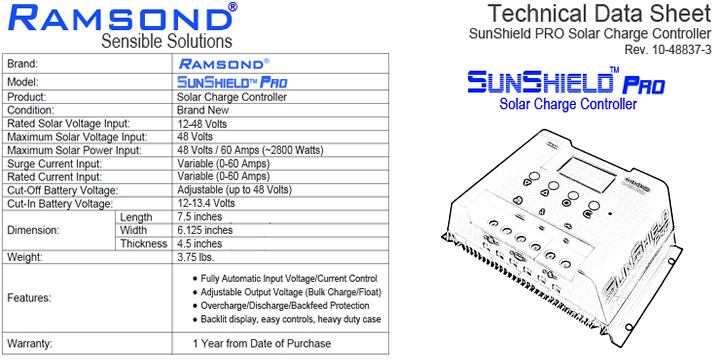 Through its highly advanced microprocessor system, the Ramsond SunShield PRO constantly monitors and regulates the voltage and current from the solar panel to the battery. It can be programmed to increase or decrease load to the battery as needed. It also ensures that the battery is maintained at its optimal charge and prevents it from over-charging and over-discharging. Additionally, it prevents the back-feed of electricity into the solar panel from the battery during hours of darkness. 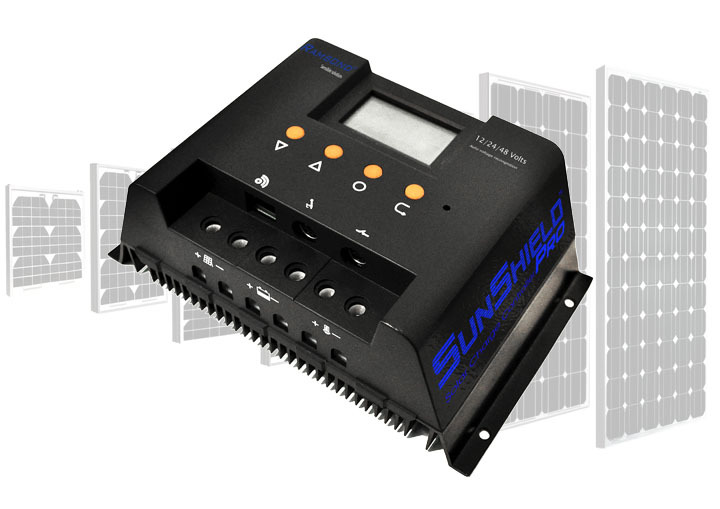 This controller is capable of handling virtually all solar panels in the market 12-48 Volts, with the maximum input current of up 60 Amps. As such, it is perfectly suitable for most 12V rated solar panels up to 120 Watts, or most any other type of available solar modules. When you purchase your Ramsond solar products here, you can rest assured that you will receive your item in good order. We do NOT sell used, refurbished or reconditioned products. All items are BRAND NEW and available IN STOCK for immediate delivery. Orders are shipped within 1-2 business days of receipt of payment. Your order will be immediately processed and shipped from one of our warehousing facilities in the US. You will also have the peace of mind of knowing that capable technicians and support team will be available to provide after-sale support. Each item, prior to shipping, is subjected to a rigorous inspection and quality control. Once the pre shipment inspection and packaging is completed, we will ship your item via the freight carrier of our choice (usually UPS or US Postal Service). From the time of shipping, the item usually arrive at your door within approximately 3-5 business days. The shipping and handling to the lower 48 States is FREE. Shipping is to your door. Shipping insurance is NOT included in this price. I have been using this controller for several months now with no problems. Its controlling 10 Ramsond 100 watt panels hooked to 15 hi amperage marine batteries. I built this system for both off grid and main power assist without a grid tie meaning a seperate system runs concurrently along side the house system but not tied to it. So far it has done an outstanding job of controlling the power to the battery bank. It one of the highest rated charge controllers on the market for much more money. Im considering another bank in addition to the one I have and will buy this controller again.